조선 영조 31년(1755)에 건립되어 진사 최광익선생이 살았던 것으로 전해지는 조선시대 주택이다. 안채·안대문채·사랑채로 이루어져 있으며, 대문채는 이미 소실되어 근래에 대문을 새로 지었다. 안채는 'ㄷ'자형으로 동쪽을 향하였고, '一'자형의 대문채는 안채와 마주 향하여 전체적으로 트인 ㅁ자형 구조를 보인다. 안채의 중심은 6칸 크기의 대청으로, 이 지역 민가 형식으로는 매우 드문 규모이다. 대청의 오른쪽에는 찬방이 있고 그 아래쪽으로 큰 규모의 안방과 부엌이 연달아 있다. 안방을 안마당의 트인 곳과 접하게 함으로써 자연채광을 직접 받을 수 있게 하였다. 대청 옆 찬방의 출입문은 안방에만 두어 안방에서만 출입할 수 있다. 안방의 맞은편 쪽으로 보이는 건넌방을 이 집에서는 '웃방'이라고 부르는데, 비교적 큰 규모이다. 이 방의 옆으로 마루와 방,부엌이 있는데 부엌은 안방 옆에 있는 부엌과 마주보는 대칭을 이루고 있다. 안방 문 앞과 건넌방 문 앞에는 긴 쪽마루를 설치하였다. 특이한 것은 대청 왼쪽 윗벽에 설치되어 있는 긴 시렁과 앞 기둥에 부착된 5단 탁자형의 시렁이다. 시렁은 세면도구와 간편한 소도구를 얹어두는 고정 탁자의 구실을 하는 매우 보기 드문 설비이다. 사랑채는 대문채 바깥 마당의 한단 낮은 터에 따로 두었는데 사랑방이 안마당 구역에서 분리되어 따로 배치된 예는 드물다. 대청과 큰사랑방·골방·온돌방으로 구성되어 있으며, 대청의 뒷면 2칸은 한단 높은 마루로 꾸며 위계를 두었다. 이런 수법은 경북지방 양반집에서 많이 볼 수 있는 모습이다. 지방에서는 보기 드문 형태를 지닌 것으로 높은 품격을 보여주는 건물이다. 지정 당시 명칭은 '해평최상학씨가옥(海平崔相鶴氏家屋)'이었으나, 집 앞에 2개의 큰바위가 있어 '쌍암고가' 또는 '쌍암 고택'으로 불린 것을 반영하여 ‘구미 쌍암 고택’으로 지정명칭을 변경(2007.1.29)하였다. 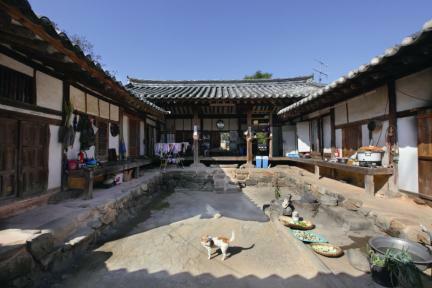 This house is said to have been built by Choe Gwang-ik (pen-name: Jinsa) in the 7th year of the reign of King Yeongjo (1731) of the Joseon Dynasty. It consists of the anchae (women’s quarters), andaemunchae ("inner gate" house), and sarangchae (men’s quarters). The daemunchae (gate quarters) was burnt down, so the gate was restored recently. The anchae was built in an open square-shaped layout facing the east direction. The horizontally aligned daemunchae has a rough, square-shaped structure facing the anchae. 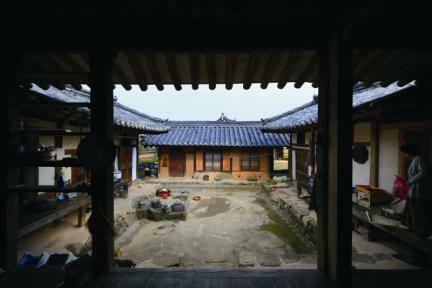 The center of the anchae is a 6 kan (unit of measurement referring to the distance between two columns) daecheong (main wooden floor), which is a very rare size for a private house in this region. The pantry is located to the right of the hall, with a large room and a kitchen in front of it in sequence. The anbang (main room) is well-lighted because it faces the open yard. The “opposite” room facing the anbang is called “utbang,” which is relatively larger than the other rooms. Beside the room are a wood-floored hall, a room, and a kitchen. The kitchen is facing another kitchen beside the anbang, forming an overall symmetrical structure. A long, narrow veranda is installed in front of the door of the anbang and that of the room across from the anbang. What is unique about this house is the long rack installed on the upper left wall of the daecheong and the 5-shelf rack attached to the front pillar of the building. The racks, which work like a fixed-type table to hold toiletries and small tools, are rarely found in ancient houses. 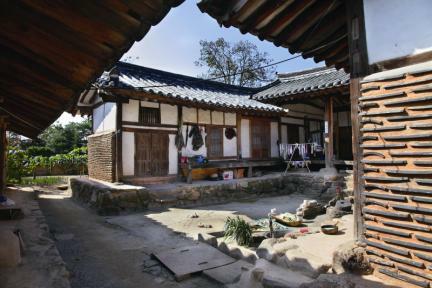 The sarangchae is located at a site that is one-tier lower than the outer courtyard of the daemunchae (gate quarters). Placing the sarangchae separately from the inner courtyard area is quite rare. 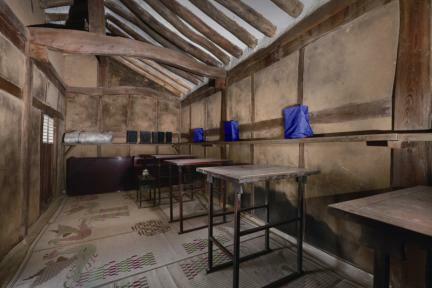 The sarangchae consists of daecheong (main wooden floor), big room, closet, and ondol (underfloor heating system)-equipped room. 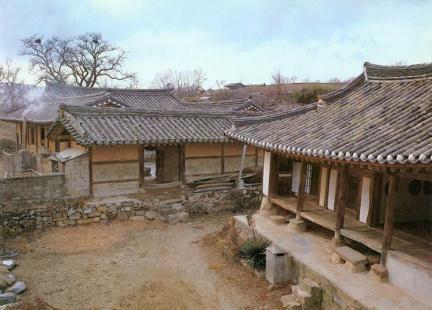 The two rooms at the back of the daemunchae have a floor that is step higher than others. 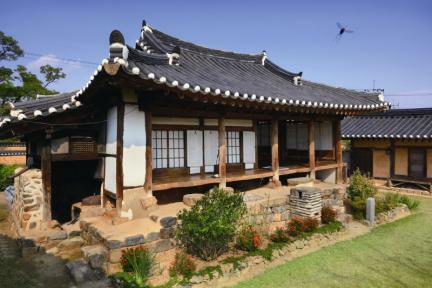 This kind of structure is usually seen at the houses of aristocrats in Gyeongsangbuk-do. With its rare, unique structure, this house shows outstanding construction technique and organization. 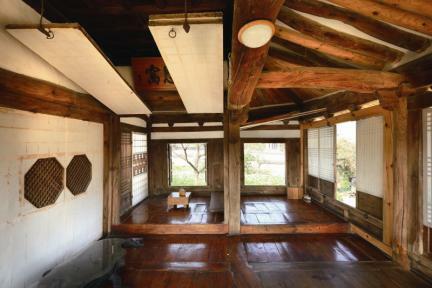 This house used to be called “Choe Sang-hak’s House” at the time of its designation as important folk cultural heritage but was renamed “Ssangam Historic House in Gumi” by reflecting its old names such as “Ssangam (meaning two rocks) Old House” and “Gumi Ssangam Old House” since there are two big rocks in front of the house (Jan. 29, 2007). ※ Viewing of the cultural property above is usually available anytime but may be limited depending on the owner’s personal circumstances.